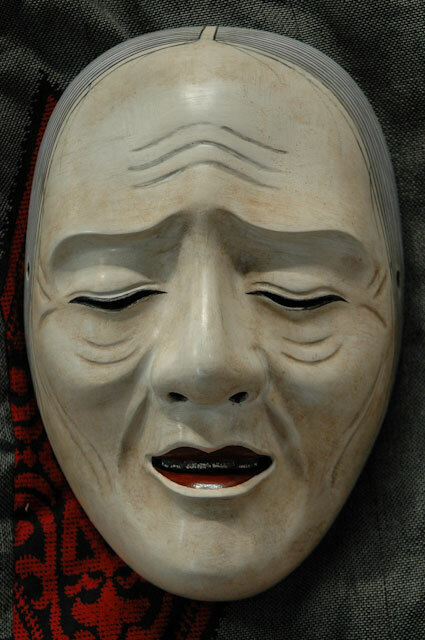 Quite some time ago a Priest from Aso Shrine in Kyushu was traveling with his companions. 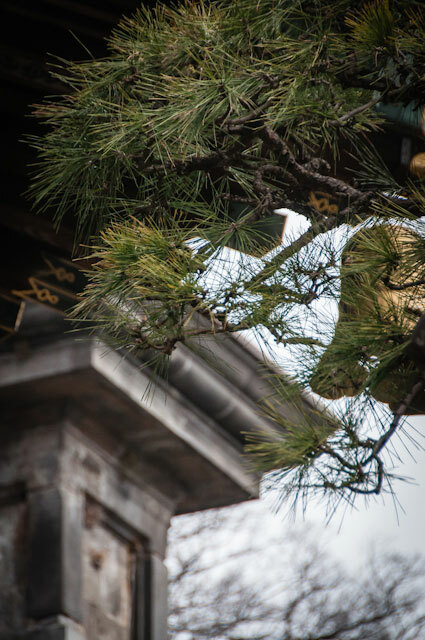 The Priest was called Tomonari, and he had decided to pay a visit to Miyako in order to view the many famous shrines and temples there, as many people often do. Now Aso Shrine was in the middle of the island of Kyushu in the south, and so it was quite some distance that they had decided to travel. They had girded on their traveling cloaks, and went away to the east, eventually boarding a boat to cross the Inland Sea. Although they were somewhat concerned about going on such a long trip, the spring winds were pleasant and it seemed as if they traveled in no time at all. Their boat grew close to Takasago Bay, in Harima. It was really a charming sight. The brisk salt breeze was blowing, the sun was just beginning to set, there was the sound of a temple bell ringing in the distance, and the waves kissed the beach hidden from view in the evening mist. An Old Man and an Old Woman were standing on the shore. With their snow-white hair, they appeared most aged, almost like cranes standing and looking out at the sea. Although perhaps their lives might be lonesome, they had the company of the winds, and the rustling of the pine trees on the beach. 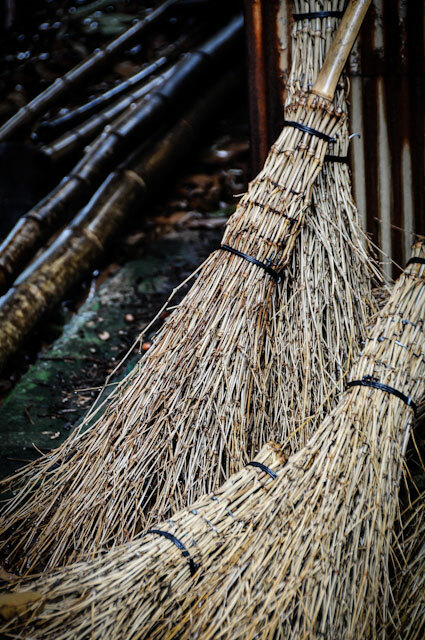 Above Takasago Bay, a venerable pine was growing, and the Old Couple had devoted their lives to sweeping the pine needles from under the tree and ensuring its cleanliness and purity. Having arrived at Takasago Bay, the Priest Tomonari saw the Old Couple. “Pardon me, sir, might I ask you a question?” “Certainly,” replied the Old Man. Tomonari continued, “Which of these trees is the famous Takasago Pine?” “Takasago Pine is right here! We’ve just swept the needles from beneath it,” said the Old Man. The sun had just now set far away in the west, and a lovely glow settled over Takasago Bay. 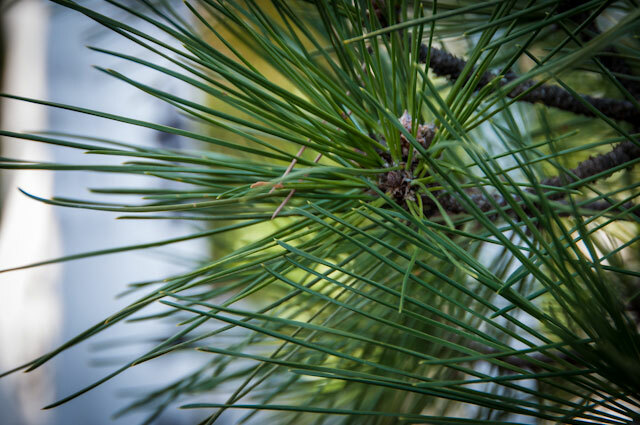 The Takasago Pine shimmered with the fading light, and the early spring evening was calm and pleasant. “Although the sun has set, and I don’t wish to keep you, could you tell some more about the Takasago Pine?” said Tomonari. “There is no point in hiding anymore,” exclaimed the Old Man, “We are the spirits of the Twin Pines, Takasago and Sumiyoshi. We stand here before you, incarnate for just a time, as a loving couple. The trees and grass have no beating heart, but in this current time of peace, all of them want to live forever under the beneficent Emperor’s reign. Now we’re going to Sumiyoshi, but come there quickly, and we’ll wait for you to arrive!” So saying the Old Man and Woman leapt into a waiting boat, and were whisked away, swiftly out beyond the horizon. Quickly they clambered aboard, and the sail was lifted. The boat was pushed off onto the rising tide under the light of a full and glorious moon. Swiftly they traveled, eager to arrive at Sumiyoshi. In almost no time at all they arrived at Sumiyoshi and the shore of Suminoe. Appearing before them in divine splendor was the Deity of that place. 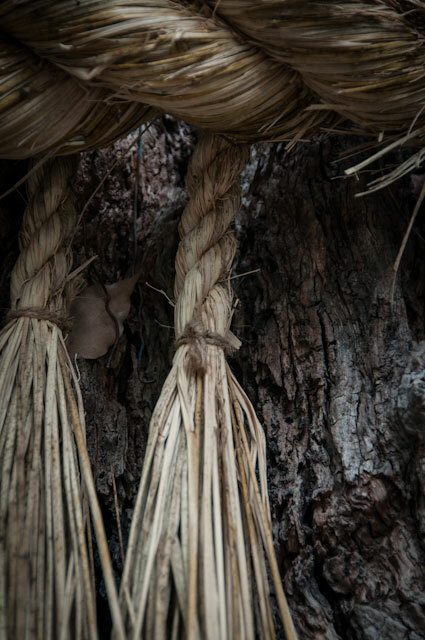 Long ago the Deity Izanagi purified himself at Aoki-ga-hara after returning from the dead, and between the tossing waves the Deity of Sumiyoshi had been born, made incarnate in the sacred pine. Spring had spread across the land, yet on the beach of Asaka tufts of snow still remained. 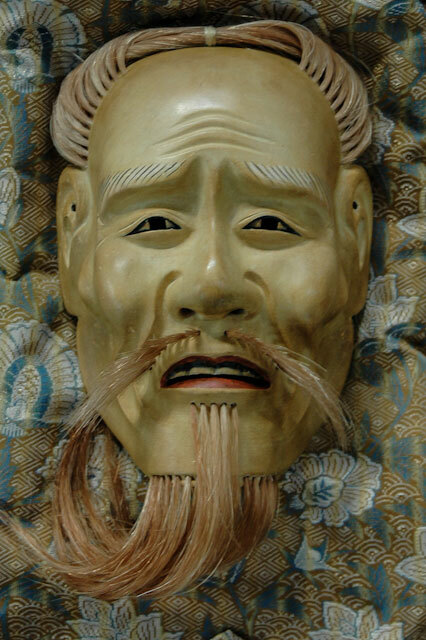 The green needles of the aged pine glowed, and the Deity of Sumiyoshi took them up in his hand and began to dance. He broke a twig with a new plum blossom and placed it in his hair, the petals turning like new winter snow and scattering on his robe. Voices of maidens filled the air, as the drums were beat in ancient rhythm. The green of the pine reflected in the blue of the ocean. 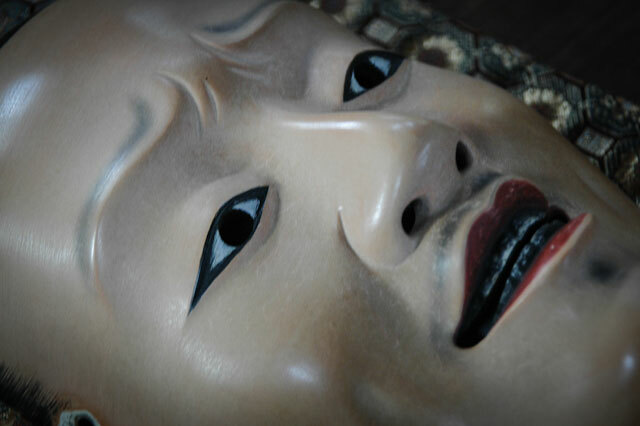 The Deity of Sumiyoshi danced vigorously, but with great dignity. He waved the sleeves of his sacred robes and drove all demons and unkindness away into the darkness. Drawing his arms together, he gathered luck and happiness for all to share. The wind in the pines of Takasago and Sumiyoshi sang with life and joy, and all who were present, near and far, were blessed. 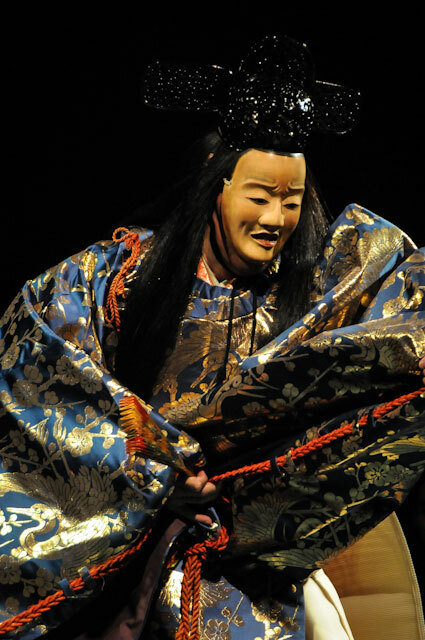 This entry was posted in Noh Play Synopses, Noh plays and tagged aso shrine, auspicious, embodiment of poetry, 高砂, first category play, Fujiwara no Nagatō, Kanze Motokiyo Zeami, Kokinshu, noh play in spring, noh summary, sumiyoshi, takasago, tomonari. Bookmark the permalink.